Nairobi — On his maiden appearance at the Boston Marathon, Kenya's Lawrence Cherono beat Ethiopia's Lelisa Desisa in a sensational sprint finish to clinch the title in 2hours, 7minutes and 57 seconds. 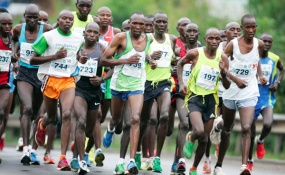 Kenya secured the top two slots on the podium with Desisa coming second two seconds after Cherono's time while Kennedy Kipkemboi was third in a time of 2hrs, 8minutes and 6 seconds. "I am very happy with the race today. I knew I was good in sprints and I saw that I could win if it got to that and I am really pleased today," Cherono said after the race. Meanwhile, Kenya's Edna Kiplagat, champion in Boston in 2017 settled for second spot in a race won by Ethiopia's Worknesh Degefa who obliterated the race from the start. The men's race was a more tightly contested affair with the leading group of almost 15 athletes sticking together for the better part of the race until the final quarter. With about 10km to go, Ethiopia's Desisa led the first breakout group that had Chelimo, Kirui, Kipkemoi, Felix Kandie and Philemon Rono. In the women's race, Degefa bolted from the rest of the pack just after the 10km mark and she revealed after the race it was a tactic passed on to her by her coach who also happened to be her husband but couldn't travel with her after he was denied a visa. Kenya's closest finisher to Kiplagat was Caroline Rotich who was sixth behind defending champion Linden, Mary Ngugi was seventh while Saina finished 10th.